Concerns that Turkey's Islamist regime could seize American nuclear weapons stored at Incirlik air base may be prompting their removal to Romania. U.S. nuclear weapons are being moved out of Turkey as the country destabilises, and as relations between Ankara and Washington, D.C. deteriorate, according to sources speaking to the EurActiv website. 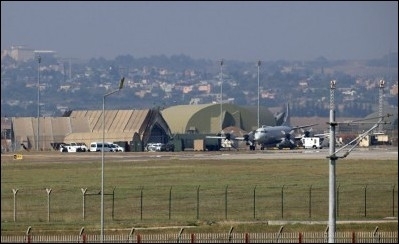 Speaking on condition of anonymity, the sources decided to speak out after a Stimson Center report warned that American weapons stored at Turkey's Incirlik air base could be captured by "terrorists or other hostile forces." "It's not easy to move 20+ nukes," said one source, although the claims have not yet been independently verified. "Whether the US could have maintained control of the weapons in the event of a protracted civil conflict in Turkey is an unanswerable question," said the Stimson Center report. "From a security point of view, it's a roll of the dice to continue to have approximately 50 of America's nuclear weapons stationed at Incirlik Air Base in Turkey," co-author Laicie Heeley told AFP earlier this week. A second source told EurActiv that Washington-Ankara diplomatic relations had "deteriorated so much following the coup that Washington no longer trusted Ankara to host the weapons." Instead, they claim, the United States is seeking to move the nukes to the Deveselu air base in Romania. Deveselu, which is around 600 miles away from Incirlik, was picked in 2011 to host a U.S. Ballistic Missile Defense System that began operations earlier this year. The Aegis system is a shield to protect NATO countries from short and medium-range missiles from the Middle East. A NATO spokesman, avoiding a question as to the movement of the weapons, said: "NATO's nuclear deterrence posture also relies, in part, on United States' nuclear weapons forward-deployed in Europe and on capabilities and infrastructure provided by Allies concerned. These Allies will ensure that all components of NATO's nuclear deterrent remain safe, secure, and effective." Romania's foreign ministry meanwhile has denied the claim, stating: "Romanian [Ministry of Foreign Affairs] firmly dismisses the information you referred to." Turkey's relationship with major Western allies such as Germany are also faltering, with a leaked report from the German government confirming how the country has undertaken a "step-by-step Islamization of its foreign and domestic policy since 2011" and "has become the central platform for action by Islamist groups in the Middle East."